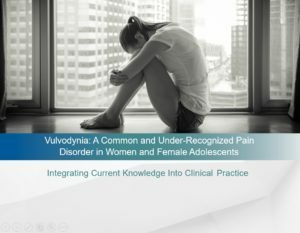 To improve the ability of health care providers to correctly diagnose and treat vulvodynia, the National Vulvodynia Association has partnered with medical experts in women’s health – gynecologists, family practitioners, physical therapists, and nurses – to develop an accredited women’s health CME/CE tutorial on vulvodynia. Because vulvodynia symptoms mimic those of common vulvovaginal infections and there are typically no visible abnormalities, adolescents and women with vulvodynia are often misdiagnosed. It can take many months or even years to be properly diagnosed. Research shows that many women often see 3-5 providers before receiving an accurate diagnosis, leading to increased pain and emotional distress, and impaired quality of life. This women’s health CME was developed for those who routinely care for women and adolescent girls. It covers prevalence, symptoms, differential diagnosis and treatment options. We sincerely hope that more medical professionals will complete this women’s health CME/CE and refer their colleagues to ensure that women receive the care they need. We have also made it simple for you to present the tutorial to colleagues by providing the PowerPoint slides below. Click here to access the women’s health CME/CE. Click here to access the CME/CE PowerPoint slides. Click here to access the CME/CE references. This tutorial has been planned and implemented in accordance with the accreditation requirements and policies of the Accreditation Council for Continuing Medical Education (ACCME) through the joint providership of Dannemiller and the National Vulvodynia Association. Dannemiller is accredited by the ACCME to provide continuing medical education for physicians.